BAGHDAD -- A wave of bombings struck outdoor markets and a restaurant in Shiite-dominated neighborhoods of Baghdad on Tuesday, killing at least 69 people, officials said - the latest in deadly militant attacks far from the front lines in the country's north and west where Iraqi forces are battling the Islamic State group. In an online statement, IS claimed responsibility only for the deadliest bombing of the day, which took place in Baghdad's northeastern Shaab neighborhood and where at least 34 people were killed and 75 others were wounded. In that attack, a roadside bomb first exploded outside the concrete blast walls surrounding the open-air market, followed by a suicide bomber who blew himself up as people gathered to help the victims of the first explosion, a police officer said. The IS statement said the attack was carried out by an Iraqi who targeted members of Shiite militias. The Associated Press could not verify the authenticity of the statement but it was posted on a militant website commonly used by extremists. Tuesday's bombings were just the latest in a wave of attacks in Baghdad and surrounding areas that has left more than 200 dead over the past week. The attacks, many claimed by IS, come as the group has lost significant chunks of territory to Iraqi ground forces over the past year. As the Islamic State militants are pushed back along front lines, the group is increasingly turning to insurgency-style attacks to detract from their losses, Iraqi and coalition officials say. Iraq is also in the midst of a political crisis that has gridlocked the country's government. While Iraqi security officials say they are concerned political instability is distracting from the fight against IS, some analysts say the extremist group is launching the attacks at a time of political crisis in an attempt to further delegitimize the Iraqi government. 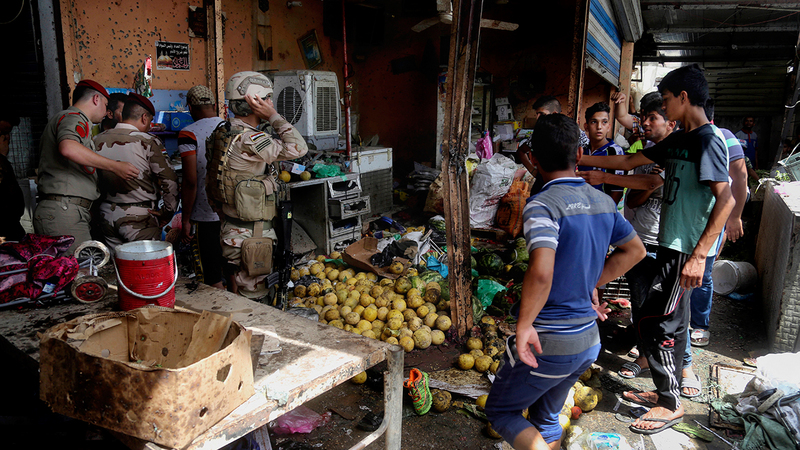 Shortly after the Shaab attack, a parked car bomb struck a fruit-and-vegetable market in the Shiite-dominated neighborhood of Dora, in southern Baghdad, killing eight people and wounding 22 others, a police officer said. In Baghdad's sprawling eastern Shiite district of Sadr City, a suicide car bombing hit a crowded outdoor market, killing 18 people and wounding 35 others. In northeast Baghdad, a suicide bomber targeted a restaurant in the Habibiya neighborhood, killing nine and wounding 18. Commercial and public places in Shiite-dominated areas are among the most frequent targets for the Sunni militants seeking to undermine the Iraqi government efforts to maintain security inside the capital. But the Islamic State has not confined its latest attacks only to Baghdad. Earlier Tuesday, Iraqi oil workers resumed work at a natural gas plant north of Baghdad, two days after a coordinated IS dawn assault left at least 14 people dead there, a senior Oil Ministry official said. Sunday's spectacular attack in the town of Taji, about 20 kilometers (12 miles) north of Baghdad, saw a suicide car bombing at the facility's main gate, followed by several IS fighters breaking into the plant where they clashed with security forces for hours before the attackers were repelled. The dead included six civilians and eight security forces while 27 Iraqi troops were wounded. Closed-circuit television images showed an explosion that sent thick black smoke rising above the plant. As flames engulfed the facility and nearby palm trees, pedestrians were seen running for cover. The top of one of the gas-processing units was blown off. Clashes lasted for hours before Iraqi troops managed to repel the attackers. On Tuesday, work at the plant's three production lines returned "to normal levels," said Deputy Oil Minister Hamid Younis. The plant was back to full capacity of producing 30,000 cooking gas cylinders a day, he said, adding that Sunday's attack had only damaged two gas storages and a few pipelines. Iraqi state TV showed workers in navy blue overalls filling metal and plastic cylinders on conveyor belts and forklift trucks loading cylinders into trucks. In 2014 after the Islamic State group blitzed across Iraq and declared an Islamic caliphate on the territory it holds in Iraq and Syria, the extremists were estimated to hold nearly a third of Iraqi territory. Since then Iraq's government says the group's hold has shrunk to just 14 percent of Iraq. However, despite battlefield successes against IS, Iraq's political leadership is in disarray. Parliament has not met for more than two weeks after supporters of influential Shiite cleric Muqtada al-Sadr stormed Baghdad's highly fortified Green Zone. The breach followed repeated delays to government reform legislation that lawmakers claimed would fight Iraq's entrenched corruption.